Big Jake’s reputation for hard working gloves has now been extended to our garment line. The Big Jake II series is flame resistant and made of PVC / Nomex® material, very similar to the original Big Jake Rainwear. However, the Big Jake 2 is lighter and offers a higher calorie rating than its predecessor. The BJ238JH jacket features a sturdy zipper front, oversized attached adjustable drawstring hood, adjustable hook and loop wrist closures, two front patch pockets and a cape vented back with D-Ring access. The fluorescent lime background material and two inch silver reflective stripes meet ANSI 107 Class 3 requirements for high visibility protection. It also meets the ASTM F1891 Standard Specification for Arc and Flame Resistant Rainwear and ASTM F2733 Standard Specification for Flame-Resistant Rainwear for Protection against Flame Hazards. The BJ238JH achieves an HRC2 / CAT2 ARC rating with an Arc Thermal Performance Value (ATPV) of 11 cal/cm2. 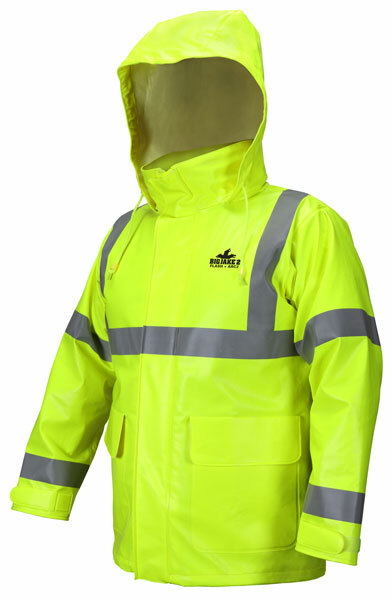 Be seen and be safe in MCR Safety’s Big Jake FR rainwear. Big Jake PVC / Nomex® Flame resistant rain pant, ANSI Class E high visibility standard, HRC2/CAT2 with arc rating ATPV 8.9 cal/cm2. Big Jake PVC / Nomex® Flame resistant rain jacket, CSA Z96 Class 2 and ANSI Class 3 high visibility standard, HRC2/CAT2 with arc rating ATPV 8.9 cal/cm2. Big Jake PVC / Nomex® Flame resistant jacket, Class 3 Type R high visibility standard, HRC2/CAT2 with arc rating ATPV 8.9 cal/cm2.